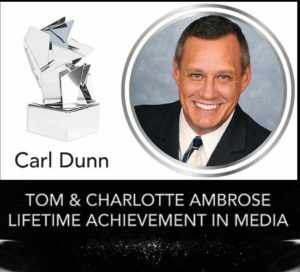 Pageantry magazine CEO, Mr. Carl Dunn was awarded the Tom and Charlotte Ambrose Lifetime Achievement in Media Award at the Global Beauty Awards. As a member of the family that helped found the industry, Mr. Dunn was recognized for his lifelong positive promotion of the Glamour Lifestyle Industry, not only through the publishing of Pageantry magazine, but also as a sought after industry expert who has been featured around the globe in media such as Entertainment Tonight, Marie Claire, Behind the Scenes at Miss USA, Newsweek, and many more. In addition to many accolades, Mr. Dunn is extremely proud that Pageantry magazine was featured in the hit movie Miss Congeniality starring Sandra Bullock and Michael Caine.